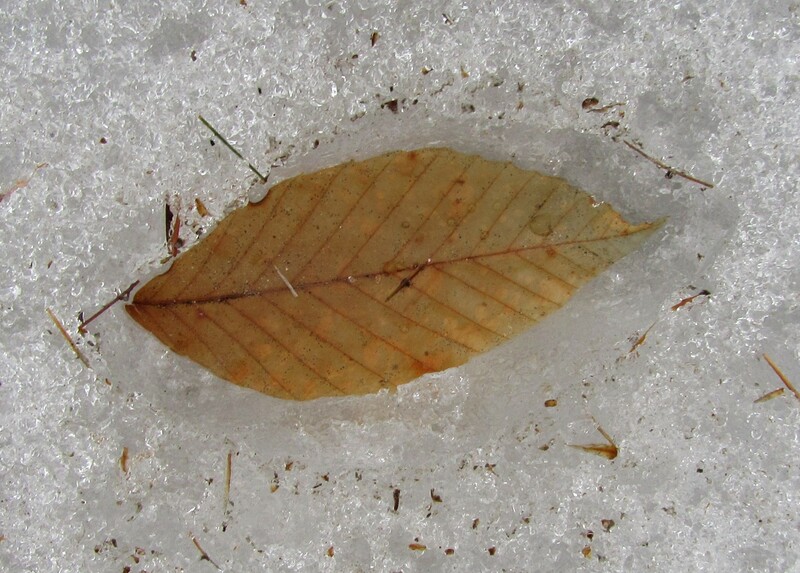 It’s amusing how much a leaf laying under water in an ice pocket can conjure rumination. It’s not the kind of rumination that comes with an unquiet mind, that sort of out-of-control thinking that spirals endlessly into itself. These icy leaf ruminations are just notions that sift through the synapses for no reason except that’s what we’re made to do with observations of Nature. We’re made to be inspired by Nature to see things that small minds miss because they don’t see small things, or don’t pay attention to them. Too bad more small minds are not amused by more small things. Small things in Nature, that is. After half a foot of sticky, soggy snowfall overnight, today the temperature at Balsamea rose well above freezing. 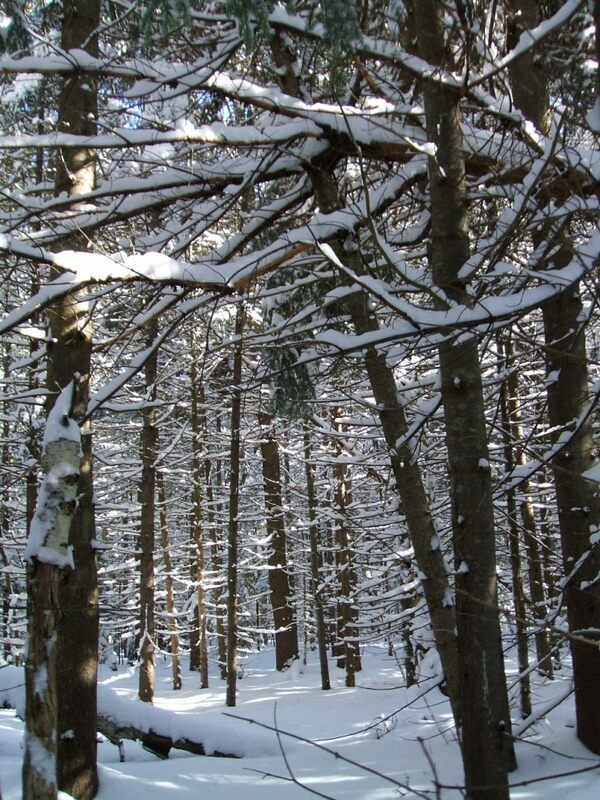 Along our trails, rapidly thawing snow showered from the trees everywhere in these dense woods, especially from the pines and firs, those bearers of great snow-loads. It fell in droplets, spoonfuls, cupfuls, bucketfuls and barrowfuls. The still, windless air said nothing while each of these sizes played their particular sounds, all around me patting, drumming, shushing and thumping their way through tree limbs, branches, twigs and evergreen boughs, then concluding each phrase with a strike on the snow on the ground. They formed an unusual percussive symphony unique to this particular circumstance, in a special variation playing upon atypical conditions in the fresh snow cover. When or where can you hear nature using trees and snow as instruments to drench the still air in sound this way, with a variety of visual effects, too? When do you get to sit in the middle of the orchestra as it plays? It filled the air within a great dome surrounding me, simultaneously at every volume possible to my ears. Some notes played a few feet from me, ranging out to ones played barely within hearing. Some struck funny notes on my ball cap and shoulders. This clip from the top of a poplar tree is one of my favorites. I’m not sure why. Maybe it’s the sky. Many things are iciclable. That’s eye-sick-la-bull. Able to have icicles. Here are some odd ones, and some traditional ones, from the perspective of a Balsamean. When in doubt, have a campfire. It has straightened my bent condition many times. On April 14, 2013, during those last days we still had snow at Balsamea, slushy places offered ideal conditions for some kinds of animal prints. What animal made this one?